In “Review into fire at timber frame housing being withheld” Mick Clifford writes about the Department of Housing delaying publication of a fire safety report into a potentially fatal fire in March 2015 in Millfield Manor Kildare. These are issues on which the thousands of owners living in timber frame homes are entitled to receive either reassurance or the bad news. Instead, the review is being withheld. Willie Crowley was a politician in the best tradition of public service. He was independent-minded and served as an independent county councillor in Kildare. He died three days after he was knocked down in a hit-and-run incident in Newbridge on December 15, 2015. On Wednesday, 29-year-old Damien Klasinski pleaded guilty at Dublin Circuit Court to dangerous driving causing the death of Mr Crowley. He will be sentenced at a later date. In court, Mr Crowley’s widow, Claire Doyle, gave a victim impact statement. She spoke in moving terms about her own personal loss, but she also touched on her husband’s role in the community. “Willie was entering a new phase of his life, preparing to stand as a candidate in the general election,” she said. “I am acutely aware of the unfulfilled potential which adds to my loss. I knew Willie Crowley for the last nine months of his life. He was passionate and persistent in representing his community. We had come into contact after I began covering a story in Newbridge. On March 31, 2015, a fire had levelled a terrace of six houses in half an hour in the Millfield Manor estate. According to design standards, it should take about three hours for a fire to spread that quickly. Thankfully, the incident occurred in the afternoon and all occupants were safely evacuated. The speed at which the fire spread gave rise to serious concerns about construction of the timber frame dwellings. The estate was built by Barrack Construction in 2006, which went into liquidation in 2011. Its principle, Paddy Byrne, has repeatedly pointed out that the construction had been subjected to checks by the building regulatory authority in Kildare County Council. After the fire, an investigation was launched by the council which found major fire safety deficiencies. The report was handed to homeowners who were effectively told they were on their own. Through it all, Mr Crowley pushed their interests. The owners had bought their homes in good faith. Now they were being told that they were living in firetraps, which would require an investment of at least €15,000 to rectify. And it would also require that neighbours on each side of terraced houses go match the investment. Most of the owners had bought at the height of the boom and could not afford the cost. Mr Crowley and a few other representatives continued to push back against what was an outrageous injustice in which citizens had not been adequately protected by state agencies. Eventually, in September 2015, the pressure yielded a partial result. 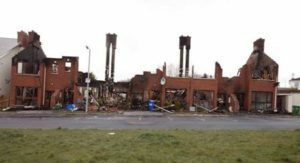 The then Environment Minister, Alan Kelly, announced a review to “develop a framework for general application” in homes where concerns had been raised about fire safety. Millfield Manor was to be used as a template. Mr Crowley, however, was not impressed. His comments were prescient. The review parked the problems in Millfield Manor until after the Febraury 2016 election, in which Mr Crowley had hoped to stand. At least six owners in the estate co-operated in the review by allowing their homes to be surveyed. They did so on the understanding that they would receive the results of the surveys. They have not been furnished with any results. Fourteen months after the review was completed, the Department of the Environment has not published it. During that time, repeated inquiries have received responses from the department saying that aspects of the review are still under consideration. It’s difficult to believe that “aspects are still under consideration”. An alternative explanation is that the department does not want to publish the review because of what it contains. If the review echoes the concerns of the investigation by Kildare County Council it may have implications for timber frame construction — which was highly popular during the boom —in general. It could also open up problems for the State concerning design specifications and building control. Mr Crowley was taken before the review was completed. He may have been elected to the Dáil in 2016. Even if he wasn’t elected to national politics, he would have continued as a councillor to serve the interests of the people of Millfield Manor and Newbridge. In either capacity, it’s difficult to believe that he would have remained silent on the failure to publish the review. It’s difficult to believe he wouldn’t have made himself a considerable nuisance to the Government — and particularly government TDs in Kildare — pushing, haranguing, fighting on behalf of the people of Millfield Manor. He may even have succeeded in forcing the government to spill out the truth. Mr Crowley’s loved ones suffered a terrible personal loss. His community, and the best traditions of public service, are also the poorer for his passing. This entry was posted in Building Regulations on May 10, 2017 by BRegs Admin.